Ethan Frome, a poor, downtrodden New England farmer, is trapped in a loveless marriage to his invalid wife, Zeena. His ambition and intelligence are oppressed by Zeena's cold, conniving character. When Zeena's young cousin Mattie arrives to help care for her, Ethan is immediately taken by Mattie's warm, vivacious personality. They fall desperately in love as he realizes how much is missing from his life and marriage. Tragically, their love is doomed by Zeena's ever-lurking presence and by the social conventions of the day. Ethan remains torn between his sense of obligation and his urge to satisfy his heart's desire up to the suspenseful and unanticipated conclusion. Perhaps reflective of Wharton's own loveless marriage, this sophisticated, star-crossed love story vividly depicts her abhorrence of society's relentless standards of loyalty. 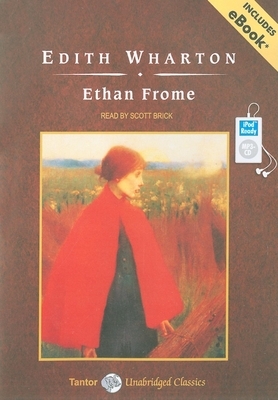 Ethan Frome is one of Wharton's most popular and best-known works. Edith Wharton (1862-1937), the author of such classics as "The Age of Innocence," "The House of Mirth," and "The Custom of the Country," is best known for her "society novels," in which she analyzed the changing scene of fashionable American life in contrast to that of Old Europe. Scott Brick has recorded over five hundred audiobooks, has won over forty "AudioFile" Earphones Awards, and has twice received Audie Awards for his work on the Dune series. He has been proclaimed a Golden Voice by "AudioFile" magazine as well as "Publishers Weekly"'s 2007 Narrator of the Year.